Along with this, both Modi and Nguyen Xuan Phuc, the prime minster of Vietnam, welcomed the facilitation of ongoing Indian projects and investments in Vietnam. Twelve MoUs covering the sectors of defense, space, IT, health, mutual recognition of standards, and cybersecurity were signed, as well as an MoU on cooperation between the Vietnamese Academy of Social Science and Indian Council of World Affairs. India pledged $5 million to set up a software park in Vietnam; Vietnamese companies were also invited to India to take advantage of the various flagship schemes and programs of the government. Modi stressed that enhancing bilateral commercial engagement between the two countries constituted an important issue in the comprehensive strategic agenda. Apart from these issues, the Indian prime minister also emphasized the need to further relations between the two countries on regional and international issues of common concern. There was, however, no precise mention of the issues on which both countries need to have a common voice. 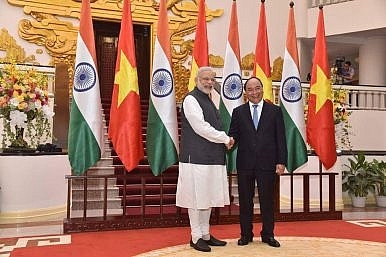 In the final leg of the tour, Modi met Communist Party General Secretary Nguyen Phu Trong, who appreciated India’s stance on the South China Sea issue. India supports freedom of navigation, overflight and unimpeded commerce in the disputed region, based on the United Nations’ Convention on the Law of the Sea (UNCLOS). On an earlier occasion, India’s ambassador to Vietnam, P. Harish, had remarked that all parties must respect UNCLOS, since it represents the foundational aspect of the international law of seas and oceans. The upward trajectory of cooperation between India and Vietnam since the 1990s reveals that the two countries have emerged as significant partners in the Asia-Pacific century. The need to sustain the current momentum of cooperation and to deepen it further, however, cannot be denied. India and Vietnam can come together on a much broader level to advance their comprehensive strategic partnership. On the Mekong-Ganga Cooperation, India and Vietnam need to address issues like infrastructure, facilitation of trade, expansion of the trilateral highway (currently including only India, Myanmar, and Thailand), reduction of transaction costs, interconnectivity of goods and labor markets, and improving funding. These steps, among others, can increase the robust connectivity between the corridors. In today’s globalized world, there are a number of transnational security concerns ranging from piracy and drug and human trafficking to global warming and climate change. Such threats cannot be faced by countries on their own. In this regard, a Joint Action Plan to tackle common threats will go a long way in not only addressing the problems but finding out solutions to eradicate these issues. Modi did emphasize the necessity of enhancing bilateral commercial engagement and the need of increasing mutual investments. The prime minister has also been robustly promoting his “Make in India” campaign overseas, which makes it clear that India is a destination that no willing foreign investors can overlook. However, the percentage of trade with Vietnam is still minimal, making up only about 1.22 percent of India’s total trade. This is expected to rise in the near future with the realization of an ASEAN-India Free Trade Agreement in services and investment. This can be complemented by the increased manufacturing capacities of both India and Vietnam, which have been getting good amount of FDI in their manufacturing sectors. India can further reap the advantages of the bilateral economic relationship if it gets integrated into the regional Regional Comprehensive Economic Partnership (RCEP), which is currently being negotiated. India and Vietnam must also work for direct bilateral connectivity and ease visa regulations for business individuals. In the defense sector, the developments are quite promising. Nevertheless, India and Vietnam can do more to develop signals intelligence and imaging, conduct joint military exercises, promote intelligence sharing, and increase surveillance and reconnaissance capabilities in the region. Vietnam can also find new opportunities under India’s new defense policy, which has laid an emphasis on “Make in India.” India can engage in Vietnam’s shipping industry by helping Vietnam to construct a viable maritime infrastructure, providing much-needed investment and quality manpower. With the rise in economic activities, technological advances, and environmental imperatives, there has been an increasing need felt by countries worldwide to throw greater emphasis on the generation of renewable energy. Investors and project developers can explore and look for new opportunities in areas of solar power, wind power, hydropower, bio fuels, and the development of photovoltaics. This will help to intensify cooperation between the two countries and complement government initiatives as well. The two countries can also seek to work together on exploring clean energy solutions and smart grid technologies. The interplay of new forces in the Asia-Pacific, and the resulting new geopolitical equation, today demands that India and Vietnam come closer together to realize the benefits of cooperation. Recent bilateral accomplishments have no doubt been steps in the right direction but there is a need to overcome the bottlenecks to realize maximum gains from this collaboration. The strategic partnership reflects India and Vietnam’s common interests, which will help to leverage the full potential of the multifaceted bonds between the two countries. Together, India and Vietnam can consider the numerous opportunities to advance these shared strategic aspirations to etch their place in the Asia-Pacific century.